This book is well wri­tten and structured with a focus on general practice settings and primary healthcare teams. The content reflects the changes in the care and treatment of people living with HIV in the UK. A range of subjects are covered, including HIV core information, how to diagnose, clinical care and a quick reference section. 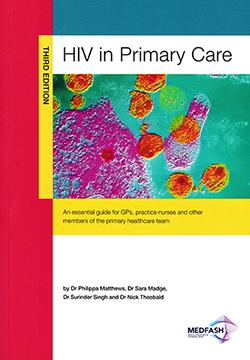 Each chapter contextualises care and treatment and identifies opportunities for testing, outlining the principles for talking to patients about HIV and the policies and procedures required in general practice. Throughout the book are examples of case studies and guideline recommendations to ensure that the reader has access to evidence-based practice.